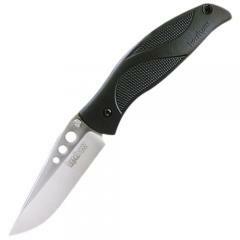 The Kershaw 1560 Whirlwind knife is quick to deploy and easy to use. Its sharp stainless steel blade deploys using an extremely rapid Speed-Safe opening system. One push on the thumbstud is enough for instant readiness, with the torsion bar locking the blade into place for enhanced security. Its versatile drop point shape can accomplish a wide range of tasks thanks to its razor-sharp plain edge and pointed tip. The glass-filled nylon handle is tough and lightweight, and its ergonomic curve provides a secure, comfortable grip. It contains a lightweight but extremely reliable inset liner lock, and carries a single-position pocket clip for portability.